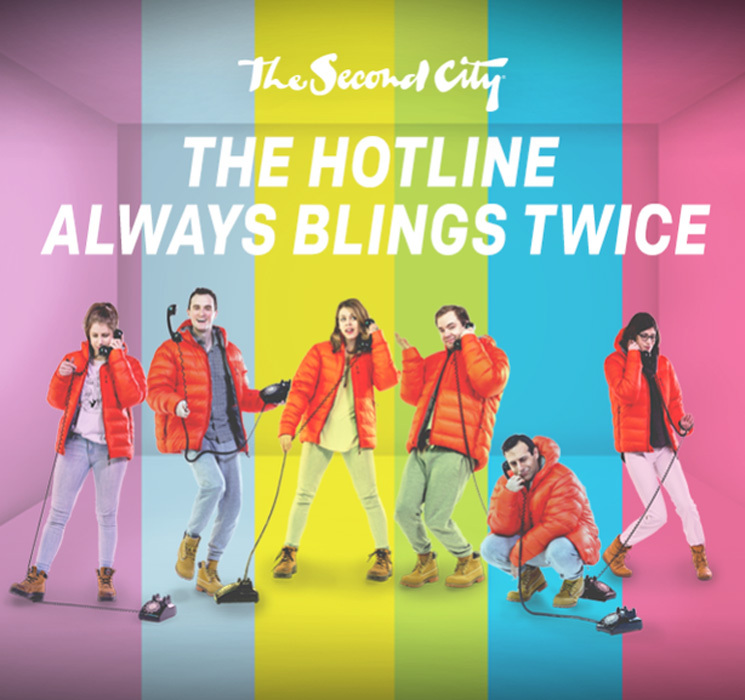 Filled with Canadian references and great takes on modern cultural issues, this edition of the Second City Mainstage Revue was broadly appealing with moments of authenticity. Though the revue was named after Drake's hit "Hotline Bling," Canadian politics was a far more prominent theme than Canadian music. The Hotline Always Blings Twice began with a speech about how Canada needs to build a wall to keep out the Americans who will be emigrating to escape Trump. Packed with pride in ordinary but lovable Canadian assets such as Tim Horton's, the CBC, and amusingly even Wasaga Beach, the bit instilled a quirky sense of patriotism in the crowd that quickly grew into a chant of "Build A Wall!" upon command. Similarly, a later sketch in which Picnicface alum Kyle Dooley played a hippie-dippie Justin Trudeau who shut up his doubters by blasting them with the power of love was equally patriotic, yet avoided pandering. Moreover, their scene in which a man from Syria (played with brilliant subtlety by Kevin Whalen) ended up joining a class of second graders because there weren't any more ESL classes available touched on foreign policy and first world privilege in an adorably vulnerable, yet funny way. In addition, The Hotline Always Blings Twice tore into a lot of au courant subjects. The sketch company predictably but enjoyably mocked binge-watching with a scene where a couple forgot what sunlight was like and even soaked their couch with "sweat or pee, I'm not sure" because they had become so engulfed in Netflix. Likewise, they cleverly skewered Hollywood's tendency to flatten diverse, innovative movies into mediocre films in a pitch meeting where two people pitched fresh concepts such as elderly women with dementia falling in love, then watched as studio executives push their scripts into heteronormative, youth-centric, whitewashed formulas. Furthermore, the followup sketch in which one of these serious dramatic pitches ended up being produced as an over-the-top action movie was also bright and offbeat. Several of the highlights of the night fit in this vein of topical comedy. The troupe's satirizing of the fight between taxis and Uber through a scene where a love triangle occurred between a woman/customer and the two competing services was brilliant. Similarly, the revue's scene about everyone jumping on the Blue Jays bandwagon, which featured Kyle Dooley as a true sports fan who didn't even do the wave because mass crowd behaviour reminded him of Hitler, was hilarious. Also, their tongue-in-cheek challenging of contemporary gender roles through a sketch in which a husband and wife negotiate which one of them should confront the robber in their house was daring. Having said that, some of the best moments of the night came from less current subjects. Leigh Cameron shone as a woman who wanted to escape her boring life to live with wolves by playing the perfect balance of crazy and normalcy, plus she stood out as an inconsolable child in a scene where a bunch of elementary school children were forced to perform a dance routine.